The season hots up for Connacht tomorrow evening in the first of four remaining Pro14 Championship conference games that will determine the club's seasonal ambitions. Champions Cup rugby next season is now the minimum requirement, but coach Andy Friend and his squad will also have their sights a little higher. Progressing to the knock-out stages is essential, not to mention a European quarter-final to come next week against Sale. Benetton Treviso are first up in the countdown, and they will arrive in full battle mode. Currently second behind runaway leaders Leinster in Conference B, they are a different outfit this season - their third under Kiwi coach Kieran Crowley. Then there is Italian side Zebre in Parma, fellow semi-final hopefuls Cardiff at the Sportsground, and the Conference A leaders Munster in Thomond Park. Thus the importance of ensuring a home win gathers momentum at this stage of the season. Another "must-win" game for Connacht, Friend says, "that is where we are at." "It's really important to get another win, another good performance. We were really pleased with Ospreys' performance, but we are after having a chunk of time off, so it's important to kick on where we left off. "We are not looking too much beyond each week. We know every game is a must-win so we are not going to say it. We know what we have to do, and if we keep winning, we remain in control of our destiny, so this Friday, it's Treviso. Get the win, and if we do keeps us in the position we want to be in." Treviso, he says, have been "unbelievable, very impressive in the way they put some sides away this year. The style they play, it's very physcial, and very disciplined, so it's a huge test for us. "They had 10 players in the Italian side at the weekend, so there's a lot of depth. They've got the physicality up front and also the skills - wingers scoring tries, a kicking game, nice off-loads - there is a lot to their game. In producing a 45-6 victory over the Welsh outfit - their biggest win this season - they did so with centre Kyle Godwin in the crucial outhalf position. And he is likely to see action there again with Conor Fitzgerald still sidelined with a back injury and David Horwitz requiring a surgical procedure to clear out his knee. However Connacht welcome the return of three-times Ireland capped outhalf Jack Carty, scrumhalf Kieran Marmion and lock Ultan Dillane, but Bundee Aki and Quinn Roux remain unavailable having played "a fair bit of rugby". "We are skinny in the outhalf position, but Kyle did a great job and is more than likely to get a chance this weekend. They [Jack Carty and Kieran Marmion] had a big weekend and our main training session was Monday, so we had them available Tuesday for the first time, so yeah, we will see how it goes there." Lock Gavin Thornbury and Niyi Adeolokun have returned to full training, but Cillian Gallagher is the lastest injury victim, having taken a head knock in Boston with the Connacht Eagles. Friend says the two week break "probably came at a good time". "We came back last Friday training, and players have been really swtiched on, I would say the last five or six weeks training sessions have been good. It doesn't always equate to quality performances, but over time it equates to accuracy and good habits, and it probably came together in the Ospreys match, so hopefully we will repeat that on Friday night." 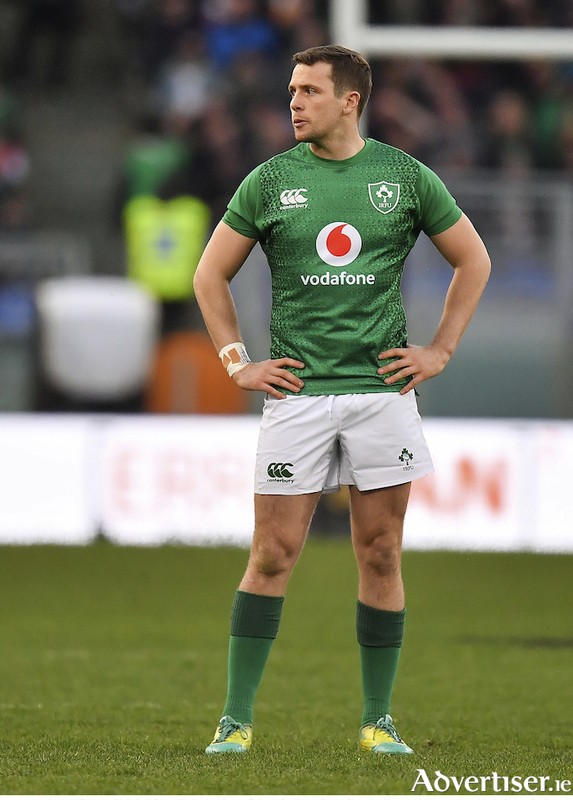 Despite the disappointing finish to Ireland's 6Nations, Friend says his handful of internationals, in addition to earlier squad members, centre Tom Farrell and scrumhalf Caolan Blade, have been rewarded with recognition for their hard work. "It's a reward for those men who have been working really hard and been performing. It's good for the squad to see it and for the individuals to get that, and for other players who may be third or fourth in their province, and thinking maybe if I get to Connacht, there's a chance if I start playing rugby I will get seen by national selectors and end up in the national squad. It bodes really well for Connacht. "If you have a losing Connacht, you are not seeing those blocks there. We have had good performances on the field this year, and out of that individuals, as well as the team, is getting recognition." Friend was impressed with his players' composure under pressure at the Principality Stadium in Cardiff. "They did well. They really picked up the pace of the game. I just enjoyed their calmness - Jack Carty, third test, well beind on the scoreboard, but he just got in and did his stuff and created a few opportunities. Kieran Marmion came on and he was very good too. Quinn was quality, so I was really pleased for those three boys and proud of the way they came on, but it was probably a game Ireland will want to put an end to quickly and move on."